An 11-year-old girl was honored by law enforcement officials in Connecticut on Thursday for her stick-figure drawing that led police to nab an alleged burglar in her neighborhood. Rebecca DePietro, of Stratford, sketched the suspect for police, who visited her family's home to investigate a streak of burglaries. They asked if anyone at the DePietro house had seen anyone suspicious. 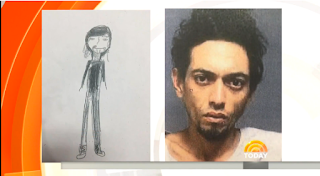 "I was like, yeah I can draw a picture of him," DePietro told NBC Connecticut. "It wasn't like the best picture, it was just a head and some legs and I thought oh he's probably just going to crumple it up and throw it out."